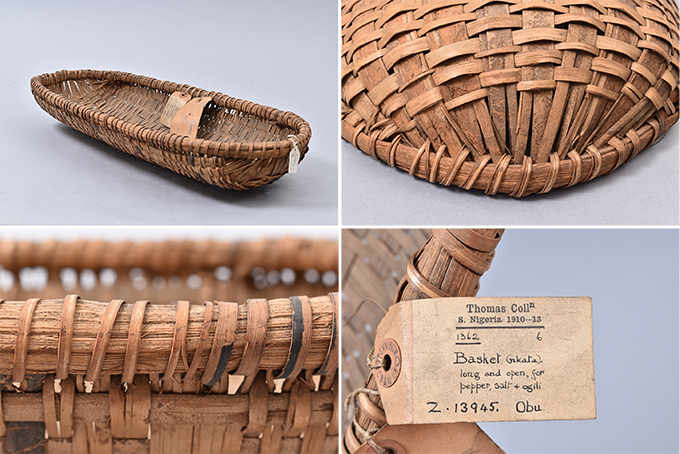 Detailed documentation photographs of a basket (nkata) collected by Northcote Thomas in Awgbu in present-day Anambra State, Nigeria. Note the various different accession numbers recorded on the label. MAA Z 13945. Over the coming months, we shall be exploring the artefact collections assembled by Northcote Thomas during his anthropological survey work in Nigeria and Sierra Leone between 1909 and 1915. The collection of ‘ethnological specimens’ was very much a part of anthropological fieldwork in the early twentieth century, and part of a broader project of ‘salvaging’ what was perceived to be the last vestiges of ‘primitive society’ before they were made extinct by the incursion of colonial ‘civilization’. Thomas had written about the need for making such collections long before he conducted any fieldwork himself and, in 1909, he echoed his earlier sentiments when justifying his collecting activities to the Colonial Office: ‘I regard the making of these collections as important. … The opportunities which I have may not recur, every year European goods are ousting native products more & more’. Judging from correspondence with C. H. Read and T. A. Joyce at the British Museum, it appears that Thomas purchased most of the objects he collected at markets or else commissioned them to be made. This is in stark contrast with the looting of antiquities and treasures that accompanied colonial campaigns, such as the notorious Punitive Expedition to Benin City in 1897. Thomas initially anticipated that the collections would be acquired by the British Museum. However, Read, who was then Keeper of Ethnological Collections, declined the collections from his 1909-10 tour, partly due to a misunderstanding about funds available, partly because Thomas insisted that the collection be kept together in its entirety, but partly also because many of the objects were indeed made especially for Thomas. As Read wrote, ‘I am by no means sure that I want these modern things made to order as it were’. Today, paradoxically, Thomas’s collecting methods would be considered highly ethical. During his 1910-11 tour in what was then Awka District, Southern Nigeria, Thomas photographed his collections prior to dispatching them to the Museum of Archaeology & Ethnology in Cambridge. As part of our collections-based research, we are identifying these objects in the museum stores. The numbers correspond to Thomas object numbers 338 to 350. MAA P.31169. Thomas subsequently offered the collection to the University of Cambridge’s Museum of Archaeology and Ethnology. A draft letter by the museum’s curator, Anatole von Hügel, to the University’s Antiquarian Committee, which was responsible for the museum, survives in which he recommends acquiring the collection. Von Hügel notes that there are some ‘2500 objects, now lying in forty cases at the Colonial Office’, and ‘Mr Thomas is very anxious that the collection shall be kept together and is prepared to hand it over to our Museum at cost price’. He adds that ‘Mr Thomas procured what he believes to be the last examples of genuine native workmanship in many villages’. The sum of £100 was raised from one of the Museum’s regular patrons, Professor Anthony Bevan of Trinity College Cambridge, and the collection was duly acquired. 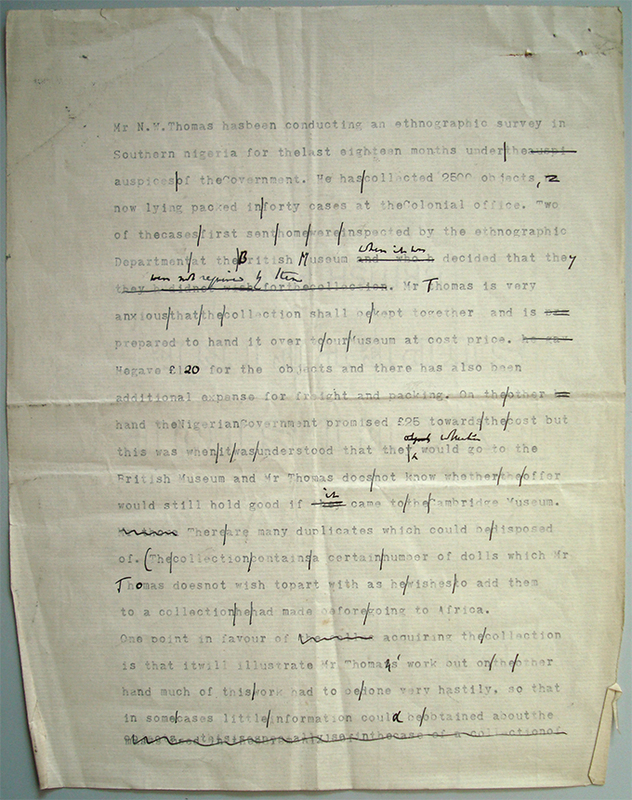 Draft letter from Anatole von Hugel to the Cambridge University Antiquarian Society, proposing the acquisition of Northcote Thomas collection in 1910. MAA archives. Having acquired the collection he assembled during his first tour in Edo-speaking areas of Southern Nigeria, Thomas was then given a grant by the Museum of Archaeology and Ethnology ‘for collecting purposes’ during his subsequent tours among Igbo-speaking communities (1910-11, 1912-13), and it appears that Thomas donated the collections he assembled in Sierra Leone (1914-15). Together the ‘Thomas Collection’, as it was known, provided a comprehensive representation of ‘native manufactures’ of Southern Nigeria and Sierra Leone. The size of the collection was such that the gallery in which they were stored at the Museum was assigned as a dedicated ‘African room’. Documenting and caring for a collection of this scale also presented challenges, especially since a large number of the objects had been damaged in transit from West Africa to Britain. The Museum’s Annual Reports in the years following the initial acquisition often mention the work of ‘cleaning, mending and restoring’ the objects; while Thomas himself assisted in the work of classifying and labelling the collections. Indeed, the work of accessioning, cataloguing and documenting the collection has continued sporadically over the decades. This work was carried out by individuals who went on to become established figures in the study of African Art, including G. I. Jones in the late 1940s and Malcolm Mcleod in the early 1970s. In the late 1980s, a project was led by Cambridge students, Roger Blench and Mark Alexander, to re-examine the collections, and today, of course, we are engaging with them again in the [Re:]Entanglements project. [Re:]Entanglements team members (Katrina Dring, George Agbo and Paul Basu) working with the Thomas collections in the Museum of Archaeology and Anthropology stores in Cambridge. Despite this occasional attention, the collections have rarely been seen. Today, only a handful of the objects are on display in the Museum’s permanent galleries. Through the [Re:]Entanglements project, for the first time we will be taking photographs of the collections back to the places from which they were collected. Thomas’s documentation of the collections is relatively limited, and we have much to learn about them. We are also interested in how the descendants of those who made or used these objects perceive them today. What craft skills and continuities in design and materials exists in these places now? And what inspiration might these collections provide for contemporary artists and craftspeople in Nigeria, Sierra Leone and beyond? Our intention is to commission new works and to display this newly-commissioned work alongside Thomas’s historical collections in our [Re:]Entanglements exhibition that will be staged in 2020. 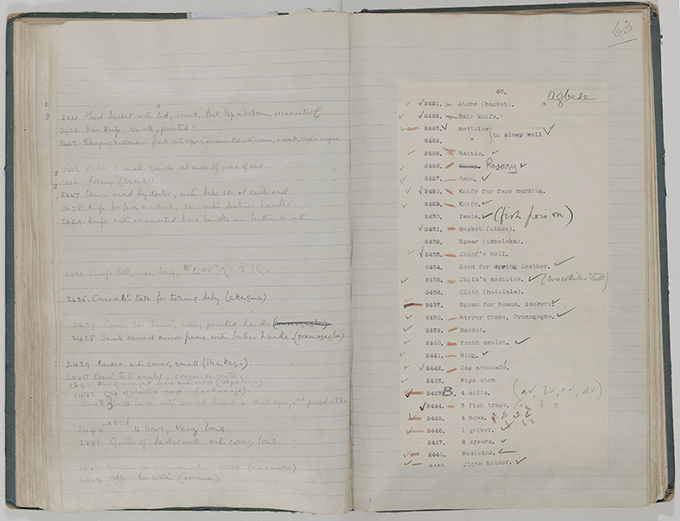 A page from the catalogue of Northcote Thomas’s collection from his first tour, 1909-10. Historical museum documentation has a palimpsest-like quality as different people have added notes and queries over the decades. Collections-based research is like archaeological excavation, as one deciphers the layers of knowledge and ordering systems that have accumulated. 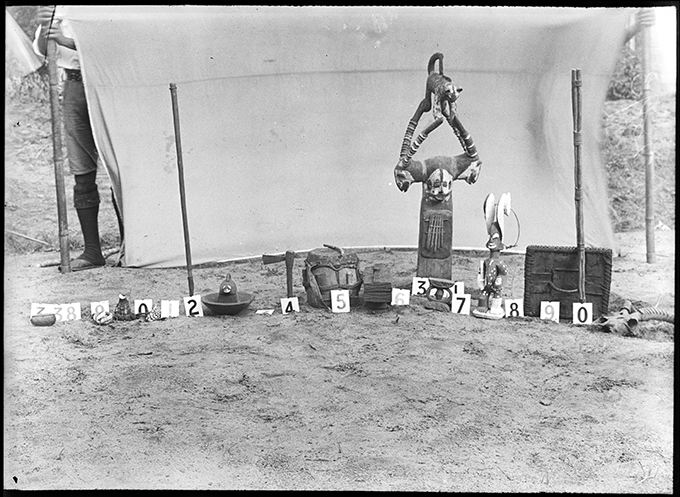 Thomas photographed some of the objects he collected ‘in the field’, prior to having them packed in crates and shipped to Britain. Our starting point as we work through the collections is to identify and locate these same objects in the Museum stores, to photograph them in detail, and to enhance the Museum’s catalogue record of each. You can follow our progress by joining the project’s Facebook Group, and, indeed, you can make your own discoveries by searching the MAA’s online catalogue.